Caring for African violets can seem a little tricky when you first start growing them, but you will find in time that they are lovely houseplants that will reward your efforts with delicate blooms. What is an African Violet? African violets (also known as Saintpaulia) are a family of flowers originally found in Tanzania and Kenya. The plant genus name came from the person who "discovered" the plant and sent seeds from the plant to Germany. There are many different varieties of African violets, but they share in common their round or oval, slightly hairy leaves and five-petaled flowers that usually grow in clusters on the same stalk. The flowers can be purple, blue, white, or, of course, violet in nature, and some of the 2,000 cultivars that have been developed expand the color range to pink, yellow and green flowers, as well as "double" plants that have flowers with more than five petals. Plants usually range in size from about two to six inches tall and two to 12 inches wide, making them a good indoor choice for homes and apartments of all sizes. There's a feeling among people who don't keep African violets that caring for African violets is difficult, but really if you just keep a few things in mind you'll be able to grow great plants that flower nearly constantly and bring color to your home all year. First off, it's a good idea to buy or replant your African violet into a shallower pot than the traditional flowerpot. Either a plastic or terra cotta pot is fine, but it will need to have drainage holes because the best way to water an African violet is from the bottom, as you'll learn in a minute. If you're planting your African violet, loosely cover the drainage holes with small pebbles before adding the soil. Place the pot in a deep saucer and fill with tepid water. Let it sit in the water for about an hour, then drain any excess water and put the saucer back under the plant. African violets will do best if they are getting plenty of light but not direct sunlight. Remember, these are plants from the rainforest floor, so they're used to dappled light. Your plant will do best in an east- or north-facing window, where the light is less harsh. You can also grow African violets under grow lights. Choose 40-watt fluorescent bulbs and place them 12 to 15 inches above the plants. Leave the lights on for as much as 12 hours a day (you can even go as high as 16 hours for some plants), leaving the light off for at least eight hours before you turn it on again. If your plants aren't getting enough light, they will let you know because they won't flower. Too much light will result in brown leaves. Most African violet experts say that the flowers should never be watered from above because water splashing on the leaves will cause spots. It's also a good idea to let the water you use to water your plants come up to room temperature before using it. The best way to water African violets is to put their pots in a large basin and fill it with an inch or so of water. Leave the plant for an hour and then remove the excess water. Always check that your plant needs water before watering it by sticking your finger an inch or two into the soil. If the soil still feels wet, don't water. 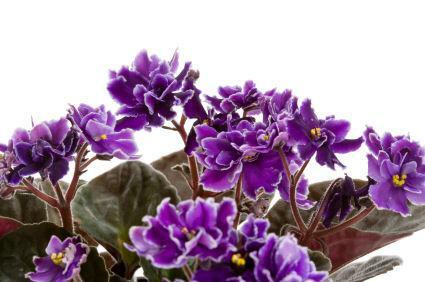 To make your African violet plants extra happy, leave them in a tray or saucer that is full of rocks. Place the plant's pot on top of the rocks and put water in the bottom of the basin, but not so high that it will touch the pot. This provides a more humid environment for the plant, which will make it happier than it would be if you just watered it when needed. Caring for African violets is not that difficult once you get the hang of the very simple rules, and they will reward you with beautiful flowers all year.